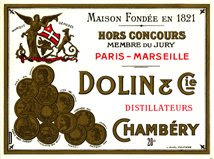 Dolin is the last independent company still producing Vermouth de Chambery. Made with same recipe since 1821, Dolin Vermouth de Chambéry has long been the benchmark for fine French Vermouth. Made with fine wines of the region, herbs and other botanical treasures found in the Alpine meadows above the village of Chambéry, in Savoie (France). Together, these unique selected components impart a fresh and elegant nose, with a subtle and complex palate. Ideal as an aperitif and great to enhance cocktails. In the late 19th century, Dolin Vermouth de Chambéry won medals in Paris, London, St. Louis and Philadelphia and in 1932 earned Chambéry France's only Appellation d’ Origine for Vermouth. Often quoted as Mixologist's vermouth of choice, Dolin crafts somewhat lighter, drier yet soft textured and more complex, less pungent vermouths than their other French and Italian cousins. Once again, it is important to stress that the particular mixture of plants found near Chambery are responsible for the fresh, distinct and elegant nose, complementing the subtle, complex bittersweet palate. Dolin Blanc and Rouge reveal great balance, with the sugar never cloying, and just enough bitterness to whet the appetite. Dolin produces the 3 worldly established type of vermouth: White Dry (Dry), White Sweet (Blanc) and Red (Rouge). My favorite being the "Blanc" that I enjoy more particularly on warm afternoon and drink with a few ice cubes and a slice (or the peel zest) of orange or lemon. Dolin Blanc is soft, delicate and elegant yet complex and rich, and flavorful. A refreshing drink to mellow your mood after a hard day at work, just before dinner, on ice or as an addition of flavor to your favorite Martini.